Bathrooms and Bars are an area to have a little FUN just like I did in our pool bathroom that I revealed a few months ago! That’s right—stop being scared. It’s not your kitchen or your living room. It’s just a bathroom. Go ahead and be brave! 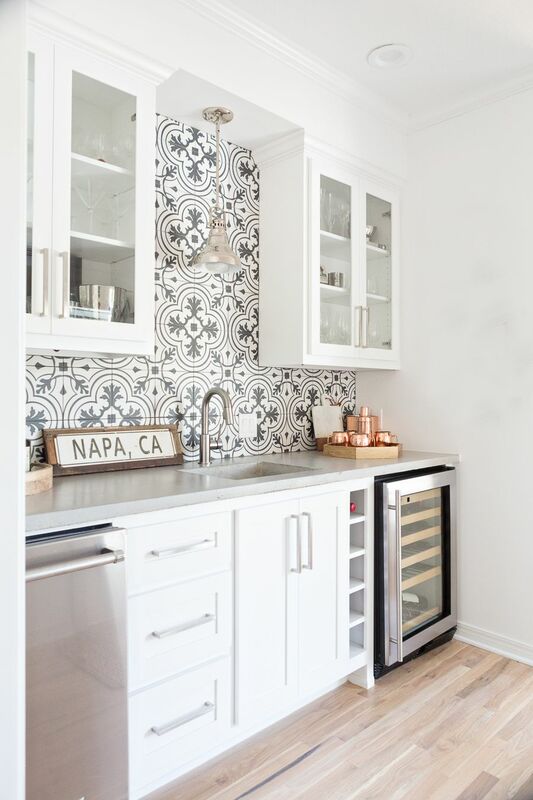 Use that patterned tile, go for the hexagon floors, paint those cabinets a fun, funky color, and most of all, DON’T BE AFRAID TO USE WALLPAPER! (Shhh! Don’t tell MM I said that. You know how he feels about wallpaper.) Here are some of my favorite products to use to help you have fun with your next bathroom or bar design! Bathrooms and Bars are a small space but they can add so much personal style to your home. Don’t overlook these areas! 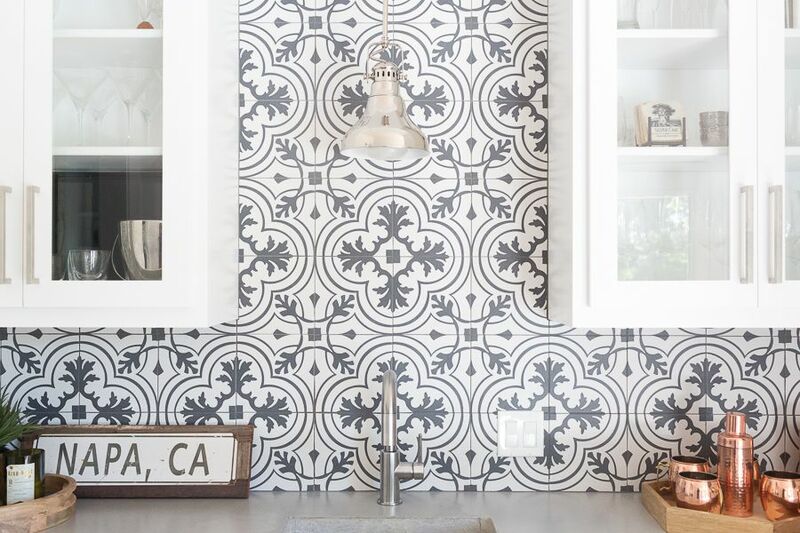 See them as not a space to hide or finish later, but instead, see modern bathroom and bar design as a fun opportunity to redo small areas that will pack a punch in the design of your home! Use fun lighting in modern bathroom and bar design. 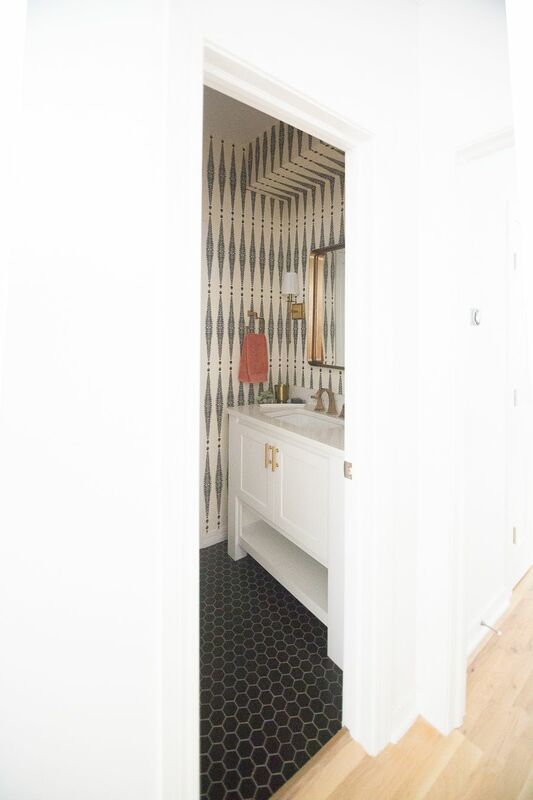 These small spaces are some of my favorite areas to use unique and fun lighting, like the cb2 pendants I used in our pool bath that hang from the ceiling or the affordable gold Wayfair sconces that I used in the Good remodel. As you will see in the photos below, I also used a drop down silver pendant in the bar area which provides an affordable yet fun and interesting element to the bar design. Here are some fun and affordable lighting options for bars and bathrooms. 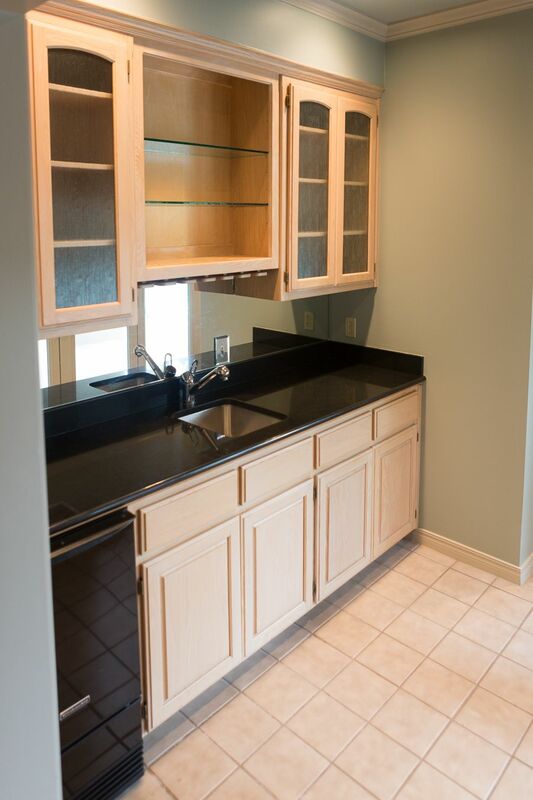 Hope you enjoy the before and after pictures of Part II of the Good Remodel. 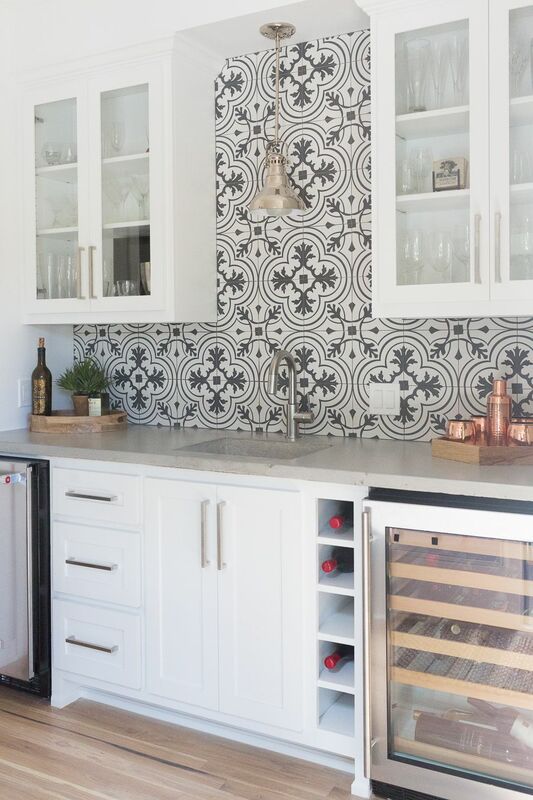 If you haven’t seen the Part 1 of the Good Remodel reveal, trust me you’re going to want to check out their kitchen and living room reveal. 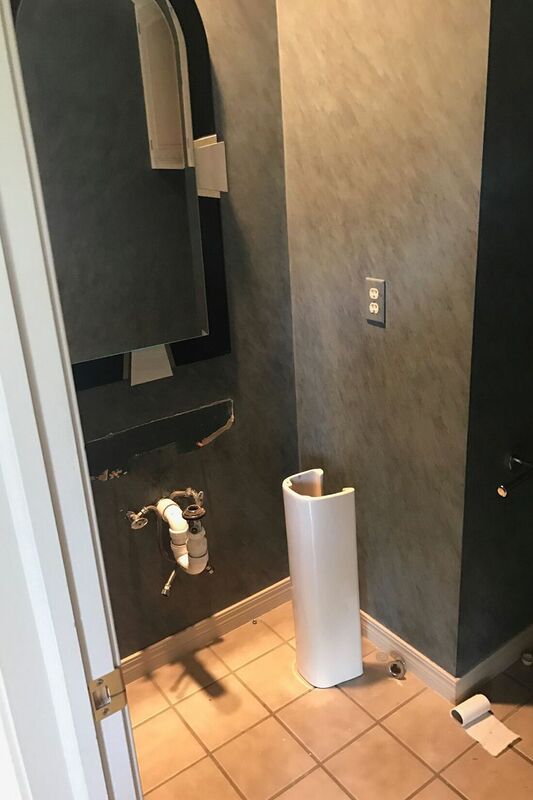 Hope you get some great inspiration for modern bathroom and bar design ideas from what we did in the bar, pool bath, and guest bathroom at the Good’s house. Enjoy the before and afters. Man, I love a Good before and after (no pun intended. OK, I lied I was totally proud of that “good” pun – you’re welcome). I had so much fun designing the Good’s guest bathroom. 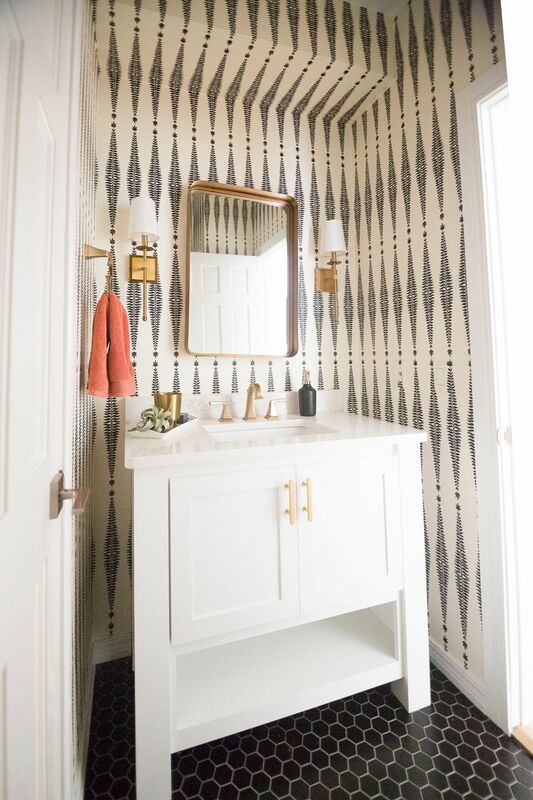 We wanted to go a little more glam in one of the spaces and like I said in my tips for modern bathroom and bar design ideas above, the bathroom is the place to have fun! 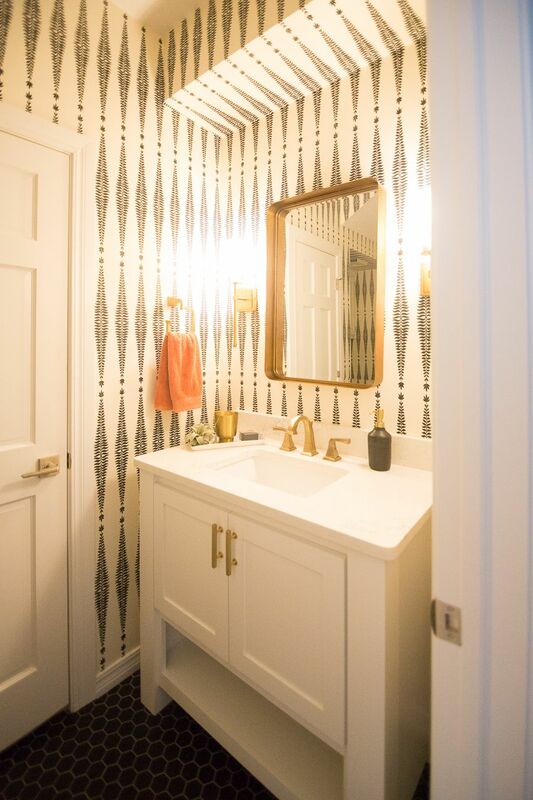 So we went with gold hardware, Robert Schumacher wallpaper, black hexagon floors, and a cute gold mirror and sconces. 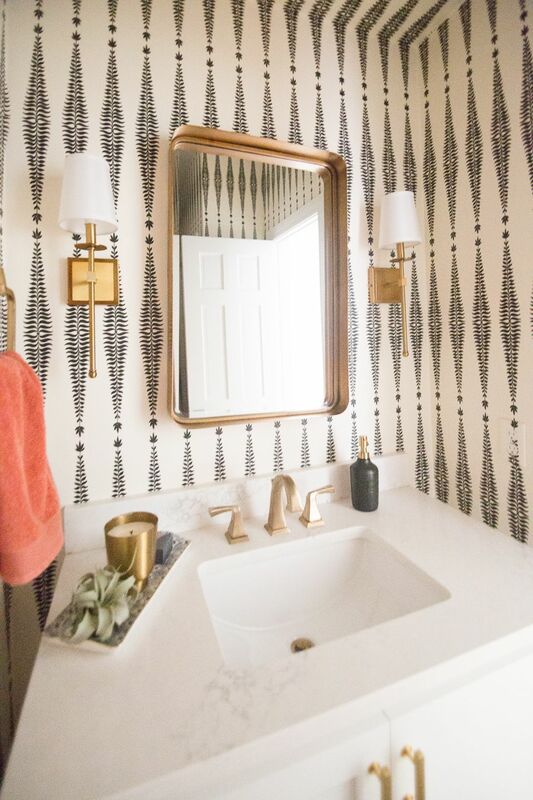 By the way, the gold sconces and mirror that I sourced from Wayfair are such a great price point if you are looking to do a more glam bathroom design! 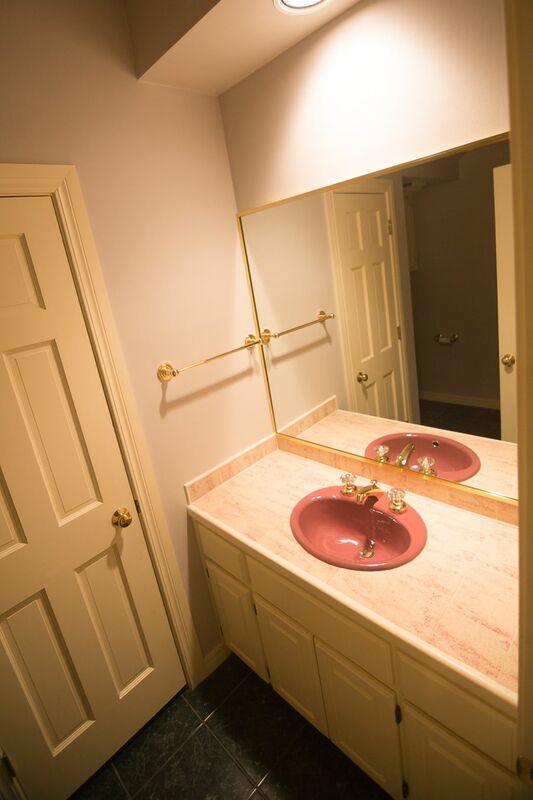 Here’s another before picture of the Good remodel pool bath…..Drumroll please…. And here’s the after. 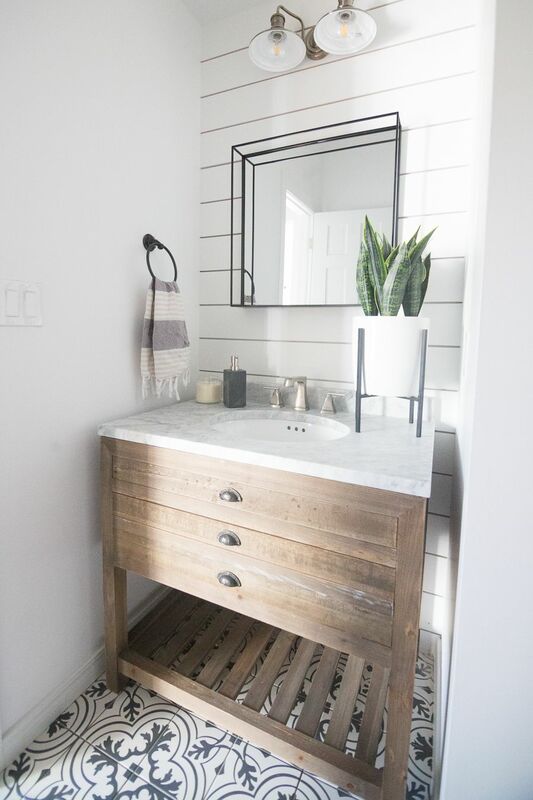 We used this this affordable, fun patterend tile for the pool bath paired with a shiplap wall, fun sconce, Restoration Hardware vanity, and a black Target mirror and cute plant on a stand. You can shop the Good pool bathroom look here. Finally, here is the before of the bar area…. And here is the after. 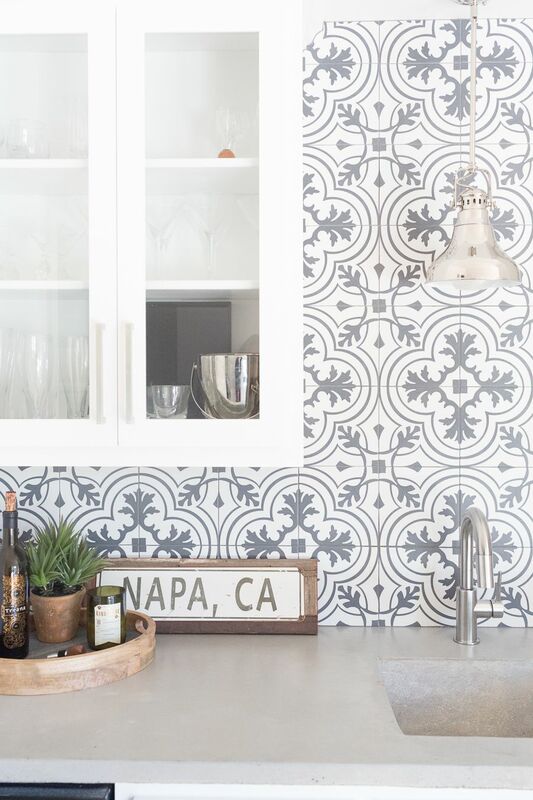 The same Patterned tile that we used in pool bath, cement countertops, and a pendant light fixture paired with some West Elm accessories is what makes this bar design fun and exciting! I love all your material choices ! You are packed full of talent! Beautiful work. 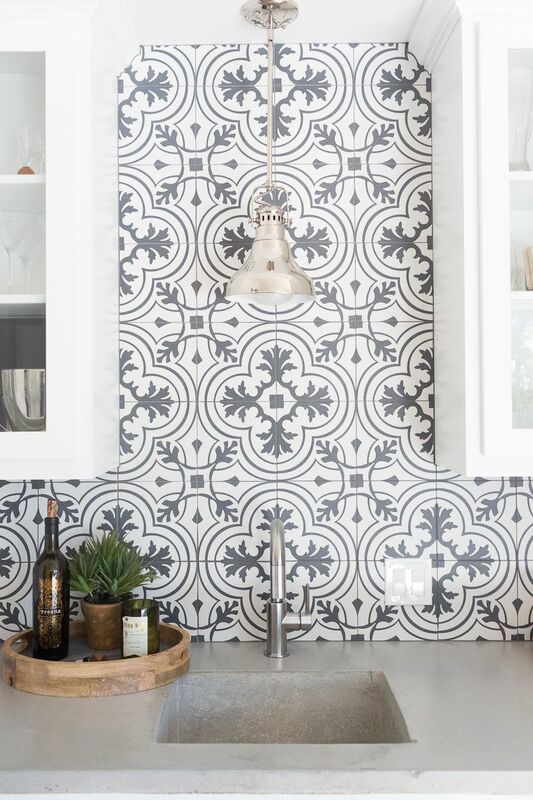 I’m wanting to copy the wallpaper for my half bath on a home we are building in Bixby, can you recommend someone to hang it? Yes I would be happy to! Can you please email me at carissa@ccandmike.com and I will give you some contacts.